Art-el Gallery has had the honour of working closely with Bristol based artist, Mr Jago for a number of years. His art is unique and collected and recognized all around the world and it is great to see that one of the UK’s most prominent gallerists has realised the potential within the artist and his work. The Outsiders Gallery, part of the Lazarides group will be hosting ‘Piltdown Tactics’ an exhibition of new works by Mr Jago, please see below for the official press release. Gallery open Tuesday to Saturday 12 – 6pm, admission free. The Outsiders Newcastle is honoured to welcome UK urban art star Duncan Jago for his first solo exhibition with the Lazarides group of galleries, Piltdown Tactics. 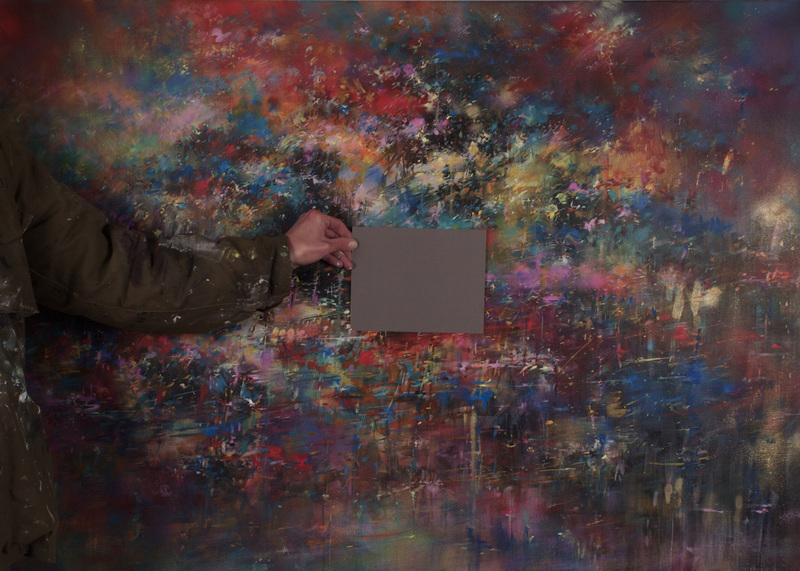 The show features Jagoʼs trademark large format canvases in acrylic and spray paint, the largest measuring six feet high by ten feet wide, and a number of works on paper. 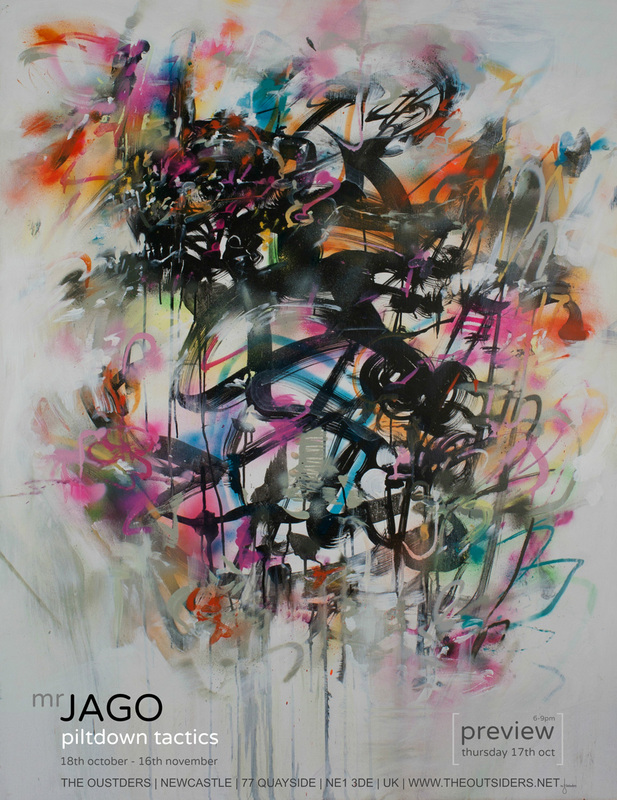 Mr Jago, to address him by his street handle, has honed his own form of graffiti-influenced abstract expressionist art over the past decade and a half. His lavish canvases, seemingly effortless synchronisations of a loose painting style and coherent composition, are things of beauty that can be marvelled at on a purely aesthetic level. However, behind the opulent strokes and deftly assembled colour palettes a voracious mind and an avid imagination work in tandem to portray a complex vision. Like the finest instrumental electronic music, the canvases and their dramatic titles slam human perception into overdrive – bridging the gulf of comprehension between the average Western metropolitan experience and the all-too- threatening issues we as a generation are only just beginning to confront. The heralds of Jagoʼs brutal new age are cybernetic kraken, champions of entropy and ushers of catastrophe. Their forms are often visible in the artistʼs portrait-format character studies, to anyone with an over-active imagination or a doyenne of dystopian science fiction. His Human Fossils series is inspired by the thought of epic conflict between these brutes, each on its own side as a metaphor for individualismʼs unseemly scramble, where sharp elbows become plasma cannons and a thick skin is represented by an ablative exoskeleton. There truly are no friends in this game, and for what? “All that crap weʼve harvested, will we be buried with it like the tribal chiefs of old were buried with their treasures?” says the artist, “archaeologists in eons to come would find it very confusing.” In this way Jagoʼs ambitious works depict the Piltdown Tactics of the exhibitionʼs name, as we all scrap in this florid muck for the sake of a legacy like that of the hoaxed millennia-old human remains unearthed in Piltdown, southern England. What delineates Jago though is his use of aesthetic beauty, however transcendent, to represent this sobering vision. This may be a shocking melodrama, but it grips the imagination with the ingenuity of the master storyteller, the wit of the court jester, and the bombast of the prodigal composer. Duncan Jago studied art in Bristol and became a staple of the cityʼs Scrawl Collective. In recent years he has exhibited at Parisʼ Galerie Le Feuvre, New Yorkʼs Opera Gallery and the Thinkspace gallery in Los Angeles. 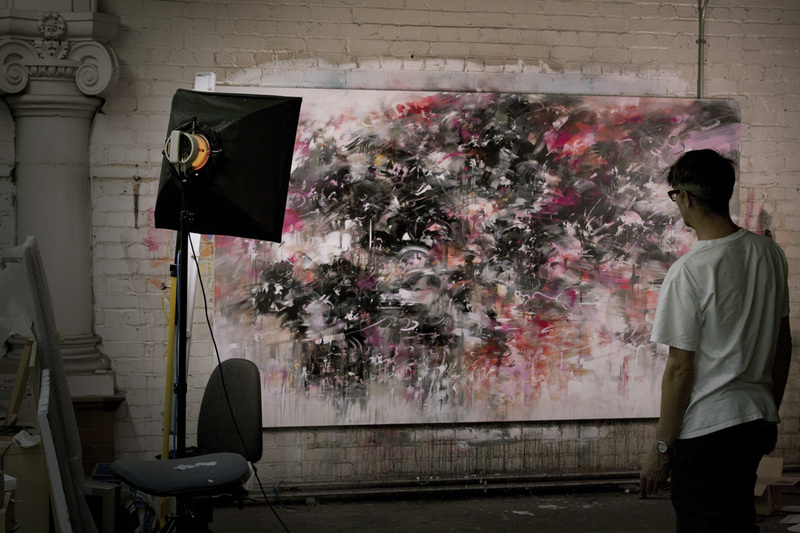 He is considered both a pioneer and an exemplary ambassador of the abstract graffiti movement. His immensely popular murals can be seen at the See No Evil event in his native Bristol and the Pow Wow mural festival in Hawaii. He was born in 1972. The Outsiders galleries sell affordable original works of art and limited edition prints from the Lazarides stable of artists. Emerging talents are also showcased alongside experimental and boutique projects from established names. The exhibition schedule focuses on work produced by artists who thrive “outside” of the orthodox gallery system. The Outsiders project was launched in 2008, with a group show in New York that attracted more visitors than a corresponding Gilbert and George retrospective at MOMA NY. The two spaces in London and Newcastle upon Tyne occupy the sites of Lazaridesʼ original galleries. Having hosted some of the earliest gallery showcases by the likes of Banksy and Jonathan Yeo, and the first European exhibitions by American artists including David Choe, they boast a proud heritage on the contemporary urban art circuit. 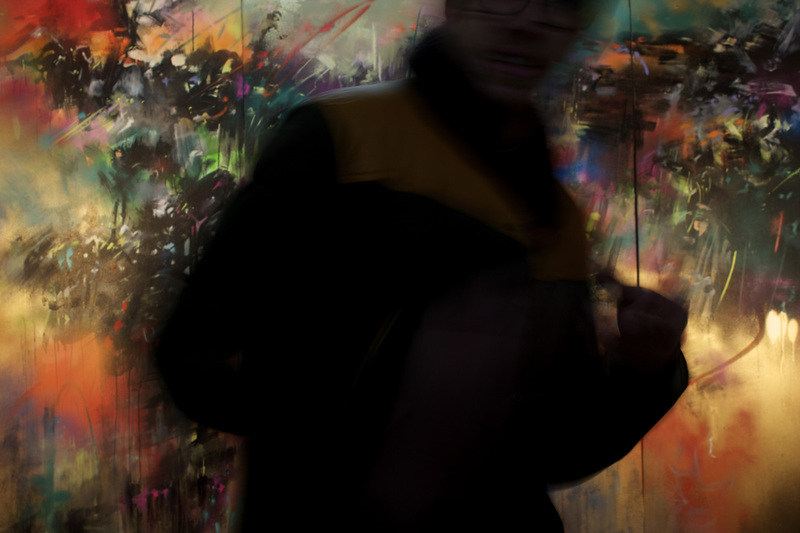 Artists exhibiting recently include Antony Micallef, Conor Harrington and Invader. The book Outsiders is out now published by Thames & Hudson and the organisation is featured in Oscar-nominated documentary Exit Through the Gift Shop. A dedicated print studio, Execution Dock in east London creates all the galleryʼs editioned works. Incorporating the thriving online art store http://www.theoutsiders.net, The Outsiders welcomes over ten thousand visitors annually. Lazarides is one of the worldʼs most influential galleries, with three permanent spaces and extensive high profile off-site activity. The group is dedicated to emerging international artists who defy categorisation, often existing outside of conventional artistic career structures. This vision has resonated with the general public and major collectors alike. Founded in 2006 by Steve Lazarides, the gallery represents some of the most exciting and innovative artists working today including Antony Micallef, David Choe, JR, Vhils, Faile, Jonathan Yeo, Charlie Isoe, Conor Harrington, Ian Francis, Stanley Donwood, 3D, Invader, Zevs, Mode 2, Todd James /Reas, Blu, Paul Insect and BÄST. For media enquiries and high resolution imagery please contact Julia Huff at Purple PR: julia@purplepr.com +44 (0)207 434 7061 or Charlotte Sluter: charlotte@purplepr.com +44 (0)207 434 7069. For gallery and sales enquiries please contact stevie@lazinc.com +44 (0)191 221 2560.